Did I mention that my kids are sharing a class this year? My kids are sharing a class, this year. An Advanced Placement science class, to be precise. Science is a strong subject for both of them, and with my son in 10th grade, my daughter in 11th, and the class spanning multiple grades, it’s not a big deal. Rather: It shouldn’t be a big deal. This past weekend, the kids had their first project for this class. The homework has been coming fast and furious since the first day of school, but this was the first multi-day endeavor for each of them. The assignment was to create a poster showcasing a given topic, and I thanked the powers that be that a rubric came home with the assignment, because both of my children will argue into eternity about anything that isn’t spelled out. Each had their topics and assured me that everything was under control. … after years of homeschooling—wherein we had the luxury of skipping this sort of “busy work” I loathe—my son has no idea how to extract the information from his brain and arrange it in a visually pleasing and engaging format. Add to this the fact that he has dysgraphia, on top of being autistic (and therefore believing that anything not explicitly written in the rubric doesn’t matter), and I was biting my tongue so hard I was seeing stars. 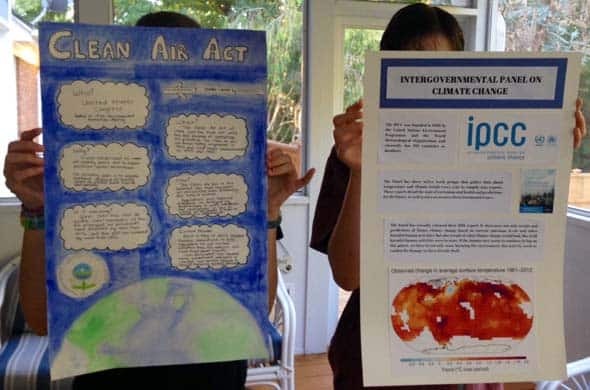 … after years of public schooling—wherein she has learned that “fluff” does indeed sometimes garner the highest grade—my daughter proceeded to spend hours designing and painting her poster rather than working on the actual information it needed to contain. Thanks to her ADHD I knew this could quickly devolve into “but I have to get this line just right” before a single informative word was written, and a late-night meltdown was sure to occur, but hey, I was already biting my tongue, so that was good. So for the first day, I stepped back. And holy crap that was hard. In the end, both posters were done on time. If their teacher didn’t already realize how different they are, well, I think this may drive it home. My daughter’s poster is both pretty and painstaking, as well as being filled with information. When they have to do their accompanying oral presentations, she’ll be fine. My son’s poster is stark, in comparison, a little skimpy on actual info, and while he knows tons about his topic, I expect his oral presentation will be… awkward. I told the kids I expect she will get a high A and he will be lucky to get a B, but my daughter is convinced that “the teacher will go easy on him because he’s autistic.” I guess we’ll see what happens. I’m worried that disparate grades will lead to strife between them, too, but if one of them truly excels while the other does not, well, that’s life, sometimes. Meanwhile, after arguing about everything, my son promised that if he didn’t get the grade he wants, he’ll listen to me next time. So am I a horrible person for hoping that maybe he gets a C…? In related news, Science Fair is coming up soon. Please hold me. Oh wow, I just read the info in the link for dysgraphia & I’m totally arm-chair diagnosing my 9 year old brilliant but ADD (diagnosed) son with it. Despite LOTS of practice his handwriting looks like a preschoolers & most of his written assignments top out at 5 words (more often than not, ONE WORD). Have you found any strategies to be particularly helpful? Is typing better? I’m seriously printing out this info to take to his first conference. My son has an accommodation in his IEP for keyboarding whenever practical. He’s faster at it but because he cannot touch type it seems to slow him down enough that he can organize his thoughts better. (I’m sure there’s some scientific explanation for that, but I don’t know what it is.) The only problem is that we’ve yet to get the College Board to allow him to type during AP exams, which means he’s going to do all of this work for his AP courses and most likely flunk the finals. Sigh. I said it before and I’ll say it again: I envy your kids’ teachers- everything they have to learn from them. I love your kids like they’re my own niece and nephew, and I thank you so much for “park my helicopter”. Because I did that with my 21-year-old, and it’s hard to explain to people why I don’t know if he’s in school this semester, or how he’s doing, or where is he working. That kid shot my helicopter to pieces, so I parked it. I do think that most teachers really do enjoy my kids; despite their foibles, they are very entertaining! I love that Monkey put in the EPA logo. Actually, I think his poster demonstrates originality of presentation. I had to do a momentary double-take at the photo when I first looked at the post because my brain automatically assigned the shorter person as Monkey and the taller one as Chickadee, but then I stared at the posters and remembered that Monkey GOT TALL. Love how Chickie is doing a pinky up pose. College Board is awful about any accommodations. My youngest had last-minute ankle surgery a few days before she was scheduled to take the SAT. I asked if she could bring in a soft folding chair to rest her foot in. Absolutely not. Could she put her folded jacket on a spare classroom chair and rest her foot on that? Absolutely not. Would they provide something that she could rest her ankle on? Absolutely not. I was afraid to even ask about her use of crutches, visualizing them yanking them out from under her as she tied to enter the classroom. I’m wondering if maybe I should send you some kind of tongue guard, with all that biting you’re doing? I don’t know if there is such a thing, but if there isn’t don’t worry. I’ma make one. I am wondering why you would call making a poster like this, fluff and busy work. Creation of a product is at the highest level, if done right, of learning: synthesis. I know it depends on how it is implemented, and if it was just kids regarding basic stuff, it is fluff – not sure this falls to that level. Fwiw, the science posters I’ve seen at the college and grad school level tend to be more along the lines of Monkey’s, although much more polished typographically. White space is an important design element! But you know that already. Graphics – I like putting in charts if I can find data. Also, I’m pretty sure that my alma mater has put limits on how much AP credit you can use as course credits. It still lets you skip to the more advanced classes, but doesn’t give you sophomore standing. Oh, and learning how to give presentations like this is something that’s very important in my field and also in engineering (software or other), and it’s not a thing I was taught until grad school despite being in a very good public school system around here.